Exclusive/Weirdness: Spinda Pokemon Myth Debunked! Not Every Spinda Is Unique! Longtime residents of Apache Junction Arizona Hiro Saeko and Anthony Gonzales have finally debunked the longtime myth that no two Spinda Pokemon have the same paterns! The two checked out the data of a copy of Pokemon Emerald and found that Spinda have 17,214 different pattern combinations, while impressive and highly unlikely that a person could end up with two identical Spinda, it is still a possibility! To put things into perspective the likelyhood of finding an identical Spinda is still much more likely than finding a shiny Spinda. What do you think about this strange story? Let us know in our comments! Re: Exclusive/Weirdness: Spinda Pokemon Myth Debunked! But I thought the chance of finding a Shiny Pokémon was 1/8192, meaning it would be more likely to find a Shiny Spinda. I could be wrong though. Nice article as always, Rukiafan! Keep 'em coming! "A Spinda's spot pattern is determined by its personality value, meaning that there can be exactly 4,294,967,296 (232, 416 or 2564) different variations of Spinda." "Any of these spot patterns could also be Shiny—this raises the total to a massive 8,589,934,592 possibilities for its appearance. However, only 524,288 of these Shiny patterns are available on each individual game—Shininess is partially determined by the original Trainer's ID and SID, meaning that every game has a different set of patterns that can be Shiny. This Shininess is retained when traded, however, like any Pokémon." "The chances of two Spinda having identical spot patterns is less than one in four billion." I guess Bulbapedia knows everything about the World of Pokémon...hey, Bulbapedia must be updated by that guy who lives in the penthouse in Celadon City! That's just story given for the game itself, but in truth there aren't quite so many patterns, it would exceed the cartridges' file size limits if it had that many flags and variables just for Spinda patterns. And each pattern Spinda has a 1/8192 chance of being shiny so the actual chances are 1 in 8192x17,214! Perhaps the formula from Bulbapedia is from the DS games? Remember that the GBA was extremely limited with cartridge capacity when compared to DS cards. 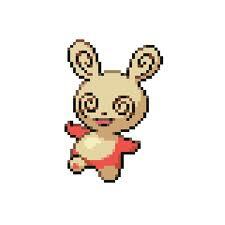 The wild Spinda used Teeter Dance! Most likely Bulbapedia is correct, however the GBA had file restraints that made the current Spinda pattern formula impossible on Pokemon Emerald. I love these exclusive features! Nice feature dude. Yes I bet the DS Spinda patterns are far more numerous, but I can't see the 4,000,000,000+ patterns mentioned at Serebii and Bulbapedia being possible on a GBA game. You should remember that it isn't 4,000,000,000+ individual sprites for Spinda. Rather, there are two blank sprites (one regular, one Shiny) without spots, and an algorithm which calculates where the spots appear on the blank sprite using the Trainer ID and Secret ID as a base. You'd be surprised what the humble GBA Game Pak can achieve. Still, that number of possible combinations does seem a little Farfetch'd! Oh yes, I went there!